Managing one team of salespeople can be tricky enough. But managing multiple sales teams in a fast scaling company - that’s a monumental challenge. You need to align your teams to follow one consistent process. You need to be able to analyze and optimize this process to drive continual improvements. You also need to motivate each individual rep to hit their own targets while simultaneously striving to meet team goals. Sales Managers trying to drive fast growth have an incredibly complicated job. But parts of your role can and should be simplified by smart, easy-to-use sales CRM software. Pipedrive Platinum is specifically designed to supercharge your growth. We want to take away the burden of managing your sales process and make selling easier for your teams so you can dominate your competition on a truly global scale. Can’t wait to see one specific new feature in action? Here at Pipedrive, we’ve seen our customers grow and evolve, but we know fast-growing teams and their managers need more support to scale up fast and dominate the market. We’ve heard your frustration. We know salespeople and sales managers both deserve a simple, easy-to-use CRM to build a truly scalable sales process across multiple sales teams. The Pipedrive team has been working extremely hard for over 12 months to develop a feature set specifically designed to minimize the administrative burden of sales for managers and salespeople in scaling global teams. Pipedrive Platinum is now packed full of brand new features that will help scaling businesses eliminate the kind of administrative barriers that handicap fast growth. 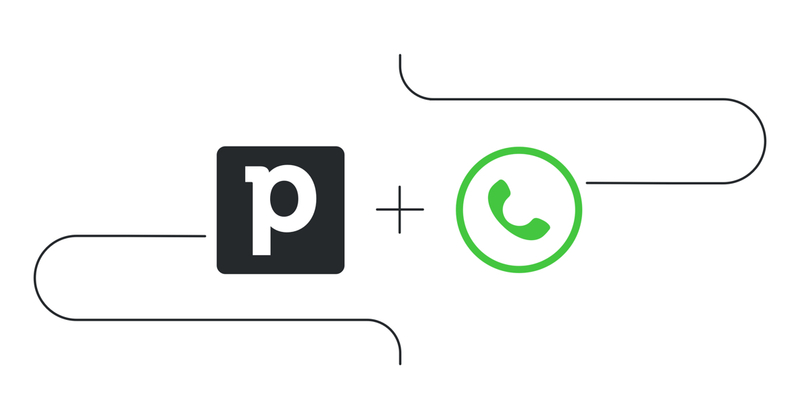 Why is Pipedrive Platinum so Helpful for Sales Managers and Reps Alike? Pipedrive is designed by salespeople for salespeople. More complicated alternatives aim to please managers first, making selling so much more difficult for the reps closing deals on the front line. These CRMs add an administrative burden to sales teams trying to scale fast. Frustrated reps often cut corners or even bypass sales processes entirely, making accurate reporting and forecasting almost impossible. Salespeople actually enjoy using Pipedrive. The tool acts as an assistant, minimizing administrative tasks and prioritizing the user’s workload. This means a more consistent sales process that is so much easier for managers to analyze and optimize. Scaling up has never been easier. You won’t need an expensive consultant or weeks of training to onboard new users. The intuitive Pipedrive interface and simple drag-and-drop pipeline view mean your team can start using their CRM in minutes. Top that with our new and enhanced Platinum Plan and you can maintain the growth velocity you need to achieve your long-term business goals. Now it's time to walk you through all of the exciting new Platinum features that will help you build the rock-solid foundation you need to scale. Why you need Teams: It’s so hard to get an accurate view of your teams’ sales activities and performance. If you don’t know exactly what your reps and teams are doing, you’ll find it almost impossible to optimize for growth. How Teams will help: Teams makes it easy to analyze the pipeline and performance of individual reps within a team or compare the performance of multiple teams with razor-sharp accuracy. Our new Teams feature is all about helping you organize, monitor, and manage your sales teams. Most sales CRMs allow you to track performance on an individual basis, but Platinum’s new Teams feature makes it easy for sales managers dealing with multiple teams or regions to analyze performance on a team level. You can chop and change as you like between individual and team performance measurement. Teams also gives Sales Managers the chance to monitor and compare individual rep performance between the members of a specific team. This means you can shine a spotlight on the inner workings of the team and find out who is continually out-performing the rest. You’ll also be able to pinpoint the team members who might need some extra motivation, some more direction, or some additional support. The Teams feature is simple, visual, and intuitive. You can hone in and focus on the key metrics that matter. No need to wade through a maze of numbers and meticulously arrange the insights you need. Pipedrive Platinum does the tough work for you. 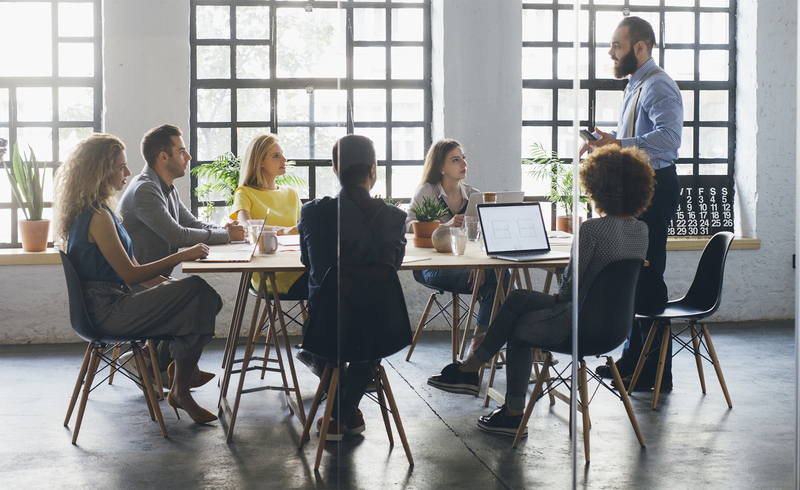 Why you need Team Goals: Goal-setting is critically linked to your growth trajectory, but setting realistic and challenging team goals can be so complicated for sales managers. Defining objectives is even messier when you don’t know what activities your salespeople are completing. How Team Goals will help: You can expect more accurate tracking and easy-to-generate reporting on the most important key indicators of any team. You’ll get clear visibility of performance making it easier to control the focus of your teams. Goal setting is one of the most important levers a sales manager can use to power a company-wide growth machine. But setting the right team goals is a tricky business. If you’re too ambitious, you can cripple morale, de-motivate your team, and fail to deliver on the expectations you set for your executives. You could even encourage a culture of corner-cutting as your teams stress about results and ditch your consistent sales process in a desperate attempt to hit these lofty targets. The flipside is equally dangerous. If you play it too safe, you risk handicapping revenue growth and allowing some team members to coast well beneath their true ability. To scale up at the right speed, sales managers should be able to rely on their CRM to track progress at individual, team, and business-wide levels so you can tweak your approach and flag potential problems before they start. Pipedrive Platinum’s new Team Goals feature allows you to give your teams a clear and aligned focus so they can spend more time actually selling. More accurate and organized performance data like this will allow you to keep improving your goal-setting in future sales cycles. This feature can also work to foster a real genuine team spirit. It’s not easy for sales managers to strike the right balance between driving the individual sales rep and aligning the entire team to push for success. When reps are competing as individuals, friction and division can build. Setting the right team goals will help you channel that competitive salesperson attitude into a collaborative ethos. A group of hungry reps chasing the same revenue growth goals can encourage reps to work together. You will see the team take responsibility for sharing knowledge, supporting new reps, and celebrating each other’s success. Why you need Cumulative Revenue Forecast: If you want to scale fast, you need a comprehensive view of your predicted future so you can make the right changes at the right times. Unfortunately, many CRMs leave you with inaccurate data and complicated reporting. How Cumulative Revenue Forecast will help: Pipedrive automatically generates accurate and time-specific revenue forecasts to help you make the right decisions and plan ahead with confidence. Revenue forecasting is not an art. You shouldn’t have to forage around your CRM and guesstimate your projections. These forecasts inform your most important decisions. They must accurately predict your future path for you to sustain success and scale at the right speed. More complicated sales tools can turn revenue forecasts into a misleading mess. If your team members see their CRM as a chore, you’ll end up with incorrect data entry. If you’re making decisions based on this problematic info, you’re setting yourself up for failure. We know you need your CRM to support this critical aspect of your job by minimizing the administrative burden and giving you clear visibility of the road ahead. The new Cumulative Revenue Forecast provides this support. Now you can easily predict revenue for a desired time period and compare it with the goals you have set. Incorporated with Team Goals - this data helps managers adjust their approach at the right time. You can highlight potential problems and prevent them before they drain your growth rates. Similarly, you can spot positive trends and double down on what’s working. This accurate and focused revenue forecast report will help you determine the right pace to scale. We really want to highlight the value of using time-specific forecasts. You can zero in on seasonal trends, or zoom out to calculate your long-term runway. This flexibility gives you rich, informative insights with a new level of speed and simplicity. As a Platinum user, you can also add a cumulative revenue forecast widget to your live Dashboard view for an even simpler way to monitor your goal progress in real-time. Pipedrive’s Platinum plan allows you to start predicting and optimizing your revenue with confidence. This means better data, richer forecasts, and cleaner reports. Why you need Permissions & Visibility settings: The larger your business grows, the harder it is to control and manage the data within your CRM. You only want to give your team members access to the information relevant to their deals - anything else will distract from their focus. 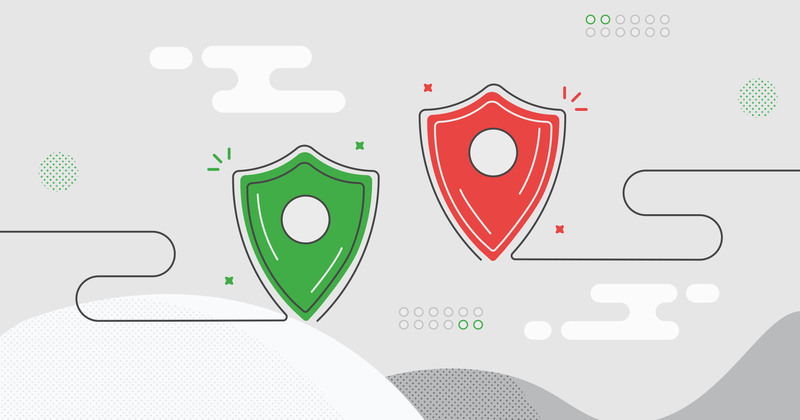 How Permissions & Visibility settings will help: As your sales teams grow and multiply, managers and IT admins need to take more control over what sales reps and other users around the company are seeing and doing in Pipedrive. Feedback from sales managers and Pipedrive admins has shown us a growing need for more flexible controls over user Permissions & Visibility settings between team members with different needs. You might want to restrict access to highly sensitive deals or limit the number of users able to create automated workflows. The bigger your business grows, the more flexibility and control you need from your CRM. Pipedrive is committed to simplifying complex administration burdens like this. We knew we had to make this part of your life less complicated. Our new permission sets allow Platinum users to create unlimited custom sets or roles. These custom permission sets can be created for specific users in your company depending on the certain Pipedrive features they need to access. Additional Sales Managers - often need the same rights as the third default Manager role (available to Gold and Platinum customers). This includes almost all admin-level rights, except for the option to manage billing (you can leave this one for your IT team). You can also do without the ability to add or delete users. Your account admin and IT can handle access inquiries. Sales managers typically want to be able to view all sales information in Pipedrive to help generate reports and analyze performance. Salespeople - may only want reps to use the pipeline, generate deals, add/update contacts, and manage activities. It’s so important to avoid distraction and keep users focused. Managers can now restrict salespeople from exporting data, deleting deals, viewing company reports (or other teams’ reports), changing visibility of items, and much more. These permissions keep your data safe and simplify the job for your users. Customer Success Managers - want to monitor the contacts they are working across to check in regularly and identify any opportunities for upselling. Notes and activities are important to these users as an account manager needs notifications on follow-ups for future events. Finance Users - sometimes need a simple bird’s eye view and nothing else. Revenue forecasts and reports will be their most valued information. You can restrict Finance team users to this information and safeguard your data, simplifying their onboarding needs. With our new visibility groups, you can take full control over who sees what in your company. Sales Manager - should be able to see all items owned by sales reps. Nobody can see the sales manager’s data. Sales team #1 - should only be able to see deals and contacts created by their team. Sales team #2 - just like the first sales team, this group should only be able to see items created by people in their own team (this way nothing else will distract from their focus). Account executives - their main focus is dealing with existing customers. This group needs visibility across all company contacts (but they probably won’t need to see deals belonging to the sales teams). Now you can manage sensitive deals and contacts with discretion and the right level of collaboration across multiple teams. This will keep each user focused exclusively on their own pipeline without any other data clouding their view. Why you need SAML SSO: As your business grows, data security becomes so important - particularly when handling important customer information. When a new team member starts you want them using your CRM without delay. Similarly, in the event of a departure - you need to be able to quickly disable access for people who have left the company. 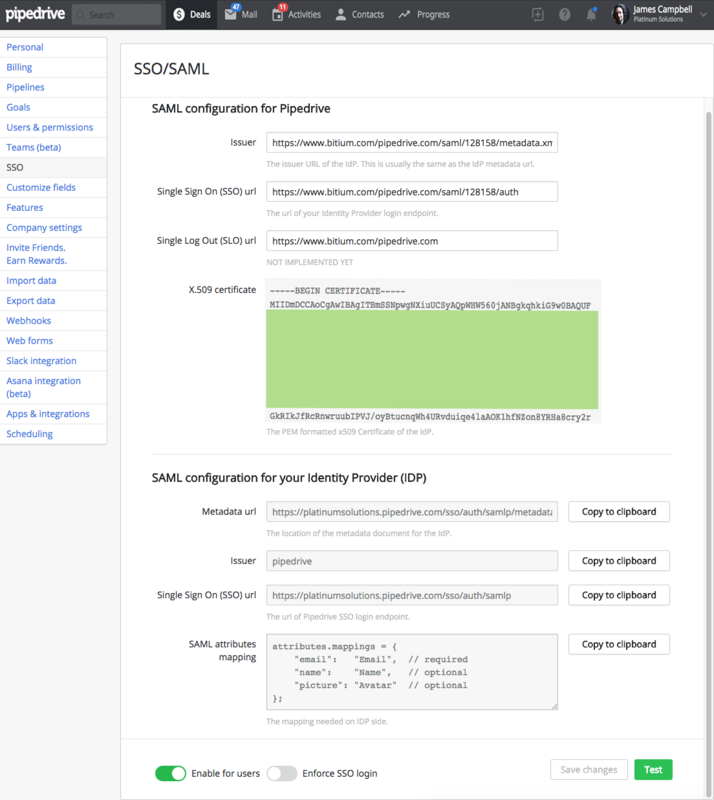 How SAML Single Sign-on will help: Pipedrive Platinum gives you a simplified login process to onboard new team members. You’ll also enjoy fast and enhanced security with centralized user management. If you’re serious about scaling fast - hiring new staff will become a constant part of your role. You can’t afford for your technology to hold back this process. When you want to get a new starter up and running, the last thing you want is more administrative work for HR, IT, or your team. We want to make compliance with your company’s IT security policy as easy as possible. That’s why Pipedrive is dedicated to making sure our customers are equipped with the strongest security options available. Our Platinum Plan secures and simplifies logins by managing all user access centrally through SAML SSO. This means no more extra passwords to learn, faster onboarding, and enhanced security for your business. Why you need Multiple Dashboards: You want quick, real-time visibility of your current performance. Your teams need to be constantly focused on the most important metrics. But sometimes your CRM seems more like a maze of numbers than a simple visual snapshot. How Multiple Dashboards will help: Pipedrive Platinum will allow you to set up a completely customized, visual dash with only the metrics you need. Even better - you can create and save a whole collection of different dashboards for all types of scenarios and teams. Fast growth demands simple, clean, focused visual reporting. We know you want real-time visibility of key indicators and progress against goals. We also know just how competitive salespeople can be. A real-time visual dashboard showcasing updated performance statistics will foster some fiery but friendly competition between teams. Our Multiple Dashboards feature allows you to create and save multiple dashboard views to declutter your sales matrix. 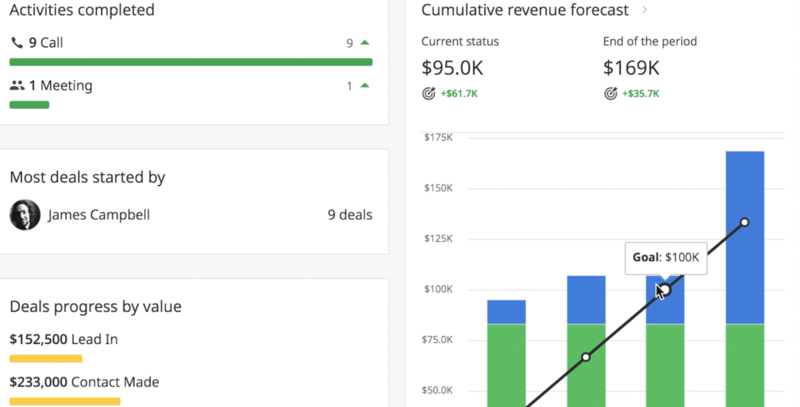 Whether you only need to see a team’s live deal and activity progress for the current week or find out how your cumulative forecast stacks up alongside the value of this quarter’s new deals - you can create a Dashboard for each, unique business need. You can compare each plan's features and pricing in more detail right now. Sign up for a free 14-day trial with just a couple of clicks. Our Platinum plan makes it so much easier for you to manage big teams, streamline your communication, and scale up fast. This collection of new features gives you an invaluable foundation to drive serious revenue growth. Take the opportunity to clean up your sales process and simplify your focus to empower your sales teams with the weapon they deserve.